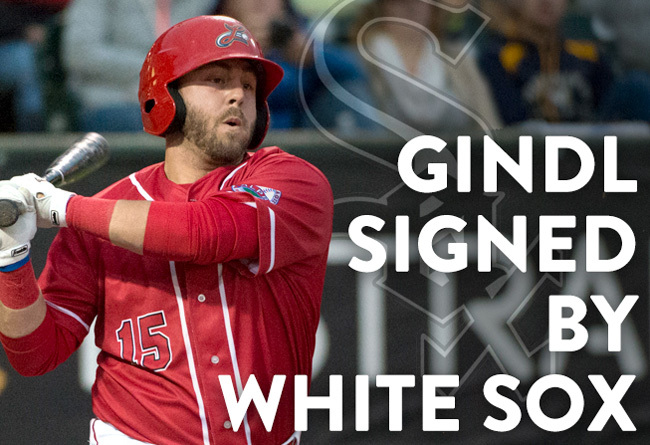 (Lancaster, Pa., Dec. 15, 2016) -Outfielder Caleb Gindl, the Most Valuable Player of the 2016 Atlantic League All-Star Game at Clipper Magazine Stadium, has signed a contract with the Chicago White Sox organization, it was announced today by the White Sox. Gindl, 28, spent the entire 2016 season with the Lancaster Barnstormers. The lefty hitter from Pace, FL batted .295 with 10 home runs, 36 doubles and 72 RBI while playing in 135 games. He tied a franchise record with a 20-game hitting streak, August 5-26. Signed as a corner outfielder, Gindl made the shift to center and handled the position with nearly flawless ability for the second half of the season. In the Atlantic League’s 19th All-Star Game, Gindl slugged a game-tying homer to right in the fourth inning. He added a single to center field in the eighth inning, picking up two of the victorious Freedom Division’s six hits. With the Freedom Division up, 3-1, in the fifth inning, Gindl dug up a single to center by Liberty DH Craig Maddox and fired home to cut down Jovan Rosa for the final out. He also recorded four putouts in the game. Gindl played a portion of two seasons with the Milwaukee Brewers in 2013 and 2014. He appeared in 65 games, batting .232 with five home runs and 14 RBI. His first Major League home run was a game winner against the Miami Marlins on July 21, 2013. The outfielder becomes the second member of the 2016 Barnstormers to sign with the White Sox this off-season, joining fellow 2016 year-end All-Star K.C. Hobson in the Chicago system.